Distress flares have two distinct purposes, to attract attention over a long distances and to pinpoint the location of the vessel in trouble. 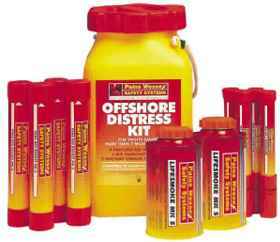 The use of distress flares indicates that there is a grave and imminent danger to life or a vessel, as such, they should only be used in an emergency situation. 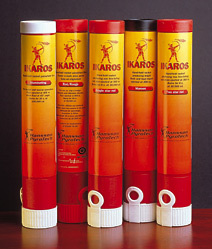 Flares can be purchased singly or in offshore / inshore packs. Handheld Red:- This type of flare is handheld as the title suggests, they give off white / grey smoke and are visible up to about three miles in daylight or at night. They are ideal for inshore uses and should only be used if you are within sight of land, see a boat or an airplane, if you can not see them, then it is doubtful anyone will be able to see you! If you can not see anything, then a parachute flare might be the best choice of flare, .Handheld flares should be restricted until a potential rescue craft or airplane is sighted. Orange Smoke: - These may be hand held or floating, both have a range of one to three miles and are very effective in daylight. Once a potential rescuer is identified the flare is best used to mark your position and to show the wind direction as in the use of helicopter rescues. Because the smoke can disperse quickly, try to fire a smoke flare in a sheltered area. If it is operated from the downwind side of the vessel, the smoke may tend to cling to the boat because of the turbulent air flow around the vessel, if safe choose an elevated position to activate a handheld flare. Handheld flares tend to last for about 40 seconds and floating orange smoke for about 3 minutes. Red Parachute: - Parachute flares are in effect small but powerful rockets, intended for offshore use day or night. Flares can rise to around 300 metres before drifting down with a bright red light luminosity on a parachute leaving behind a clear smoke trail that can be seen over considerable distances. Because of the height these flares can reach they can be seen up to 25 miles away if the weather is clear enough. Parachute flares should be fired around 10 - 15 degrees downwind of the vertical for them to reach optimum height, for safety reasons they should be fired clear of any enclose spaces such as a wheelhouse. In the first instance it is advisable to fire two with five minute intervals, in this way there is a possibility of someone seeing it and the second one confirming its direction / position and a better chance of rescue if you follow this pattern. White Flares: - White flares are not official distress flares, but they are still worth carrying, their main use is for indicating your presence to another vessel when faced with a risk of collision. White parachute flares can also be used for illumination at night such as in the case of a man over board. Launching a series of white parachute flares at night can keep an area illuminated whilst you search for a casualty, although they should be used carefully as you may find that they destroy your night vision. Life Span: - Distress flares typically have a three year life span, after this time they should be carefully disposed of. When you replace out of date flares, you should normally be able to return the old ones at the same time. Some Coastguard / lifeboat stations, harbour masters or marine chandlers are willing to take them, however, they are sometimes reluctant keen to do so due to changes in Health and Safety laws but may often give relevant advice. 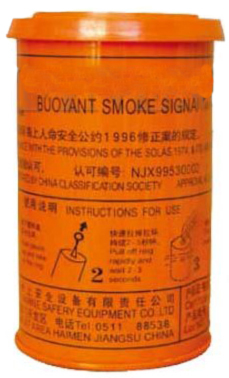 The disposal date is usually written on the side of flares (check packaging for dates), as whilst they may still work after this time there is an increased risk that they may misfire with catastrophic consequences. They must NOT be kept for bonfire use such as November 5th, more so if you live by the coast! Any misuse may result in a search and rescue operation being activated and you may also be prosecuted! There are several different systems used to operate a flare, you must be familiar with those on your vessel, and where possible to have attended a flare demonstration which can occasionally be organised by a yacht club, you may get the chance to fire off handheld flares where they can not be confused with a real emergency but not parachute ones. It can be surprisingly hard to ignite some hand held flares as they require quite a sharp blow to the base to work, this can be achieved by banging them on the deck of the vessel if you are not strong enough to do it by hand, but care should be taken not to drop the flare. At a hearing in Medway magistrates'' court, the offender was found guilty of improperly making a distress signal from his vessel. The court granted a conditional discharge to the man, who lives aboard his vessel, following his breach of the Distress Signals and Prevention of Collisions regulations. He was also ordered to pay costs of £100. The court heard how on the 4th of November 2001, the man had indicated to the Medway Navigation Service his intention to set off an out of date red rocket parachute flare. He was advised it was illegal to set off such a flare unless there is an emergency. However, he went ahead and fired the flare, which had an expiry date of 1998. The court also heard how his action had the potential for disruption of the Search and Rescue services, damage to property and injury or loss of life. "The misuse of distress flares is a very dangerous practice. HM Coastguard will react to all distress signals received and whilst we are dealing with what is effectively a hoax signal, others, who may be in genuine distress could be prevented from receiving the full attention of the rescue services. Out of date flares should never be fired, as they can become unstable and they should always be disposed of safely. Most Coastguard stations can store out date pyrotechnics where necessary." When using any flare it is advisable to wear a glove as flares burn at high temperatures. You should consider keeping a tough glove close to the flare box to protect your hand from the heat and / or burning material that can fall off a burning flare. Always treat your flares with care and respect, on board a boat flares should be kept in a dry sealed container and readily accessible. Used properly they can save your life, used carelessly they could kill or seriously injure you! The lifeboat station has now ceased the use of maroons, an information page sheds new light on the phasing out of maroons at Whitby.